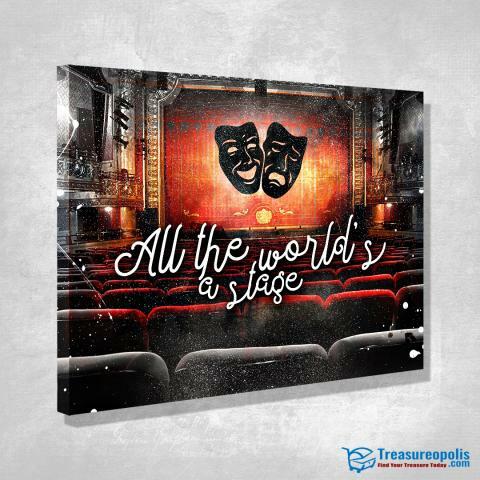 Treasureopolis.com is celebrating the launch of the wall canvas "All The World's A Stage" on 7/12/18. Our business will celebrate the launch of this new piece for all our theater niche customers and friends. Further information can be found at https://treasureopolis.com. In a exciting change of pace, Ecommerce Store “Treasureopolis.com”, will be celebrating the launch of its new “theater lovers” catalog of framed canvas art for the home, office. or studio. Our business will celebrate the launch of these new and original stretched canvas prints for all the performers, teachers, friends and customers of the theater arts niche with a celebration event that will take place on Thursday 7/12/2018. In a space where most competitors simply launch and keep quite about it and fail to cause much of a stir, Treasureopolis has opted to be a little more exciting with it’s new Canvas Art: “All The World’s A Stage” launch. Brian F Adams, Owner at Treasureopolis, says: “We wanted to be exciting with our new product release in the theater canvas art space because we wanted to put our brand on the map for all our actors, performers, and theater enthusiasts! It should be really worthwhile and we’re hoping it makes this new product as popular as some of our current best sellers. It should go great unless our order desk blows up! Actually, we can handle that too. Treasureopolis has always thrived on the idea of standing out and making a commotion. It’s all part of the fun and it’s going to help our customers see our newest original prints, which we think is better than businesses who choose to do things the ‘regular’ way. This launch celebration is just one of the many ways Treasureopolis achieves that goal. When asked about Canvas Art: “All The World’s A Stage”, Brian F Adams said: “We think it’s going to be a real hit because it is a truly unique piece our followers and customers are always looking out for”.